In case you haven’t seen the newest Sew Fab bundle sale, then let me be the first to let you know that Paisley Roots‘ Saffron Twirl Dress is included! *I am not an affiliate of Sew Fab, but Paisley Roots is so if you buy the bundle from the links in this post Karly will benefit! I adore this dress. 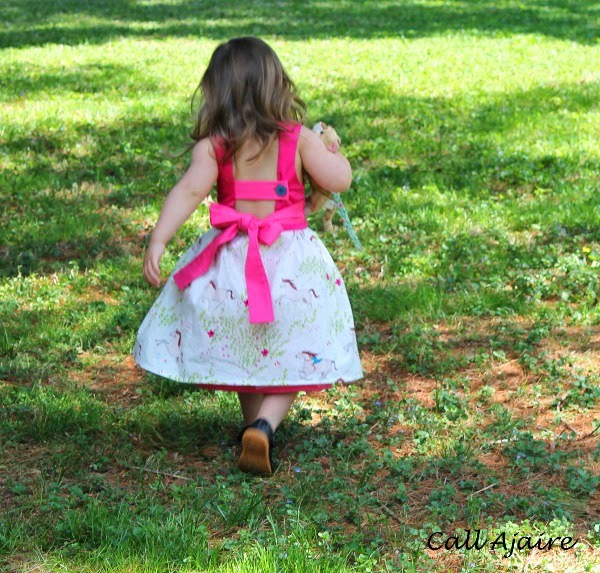 Way back when – you know before she won Season 8 of Project Run & Play and became famous – Karly sent me this pattern to review and I immediately made two dress for friends of ours that we were visiting for Labor Day Weekend 2013. Yeah, I told you it was a while ago. Anyway, I made the two dresses and the girls loved them so much that they could barely stand still for a picture. I decided I needed to make another one for Bean, but since we were heading into colder days I asked Karly if it was okay to post for her Easter dress this spring instead and she agreed. At the time we had no idea it would be part of Sew Fab, but it all worked out so well. 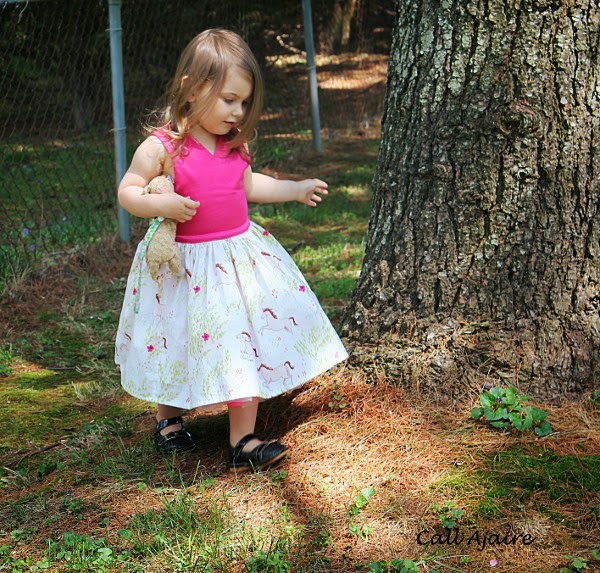 Using this Sarah Jane Wee Wander fabric that I’ve been hoarding for the skirt, I jumped right into making an Easter dress. I sewed a size 3 and it fits Bean like a glove. Absolutely a perfect fit. To complement the skirt fabric, I used a bright pink sateen and some neon pink stretch twill for the bodice. The sateen is directly on the bodice and the twill was used for the straps and across the back. I love the shape of the back. The cut-outs that the back strap leaves are really trendy this spring/summer so Karly was definitely onto something when she designed it last year. I used a blue button as a nod to the blue of the little girl riding the horse’s dress in the skirt. One change I made was to make the skirt double layered. All I did was add a second skirt panel under the main skirt and then treat them as one, but gather them separately. The Wee Wander fabric is light and airy, but in this white colorway it was more sheer than I would like a skirt to be. Adding more of the neon pink stretch twill as an underskirt worked perfectly. And while we’re talking about gathering I should mention that this pattern’s instructions are so good. This dress is so well constructed and Paisley Roots didn’t leave anything out in the tutorial. The pattern says to make three basting lines around the skirt to do the gathering which sounds SO CRAZY and time consuming. I mean seriously, who has time for that? But, I love Karly so I listened to her and wow it actually made the gathering SO EASY that I always use three lines now. I swear the extra time I spend basting is way less than the time I used to struggle with pulling those basting stitches just right. With the three lines pulled together the fabric just sort of cinches up. She’s a smart cookie, that Karly. By now you’re probably wondering why I’m posting about an Easter dress in May. 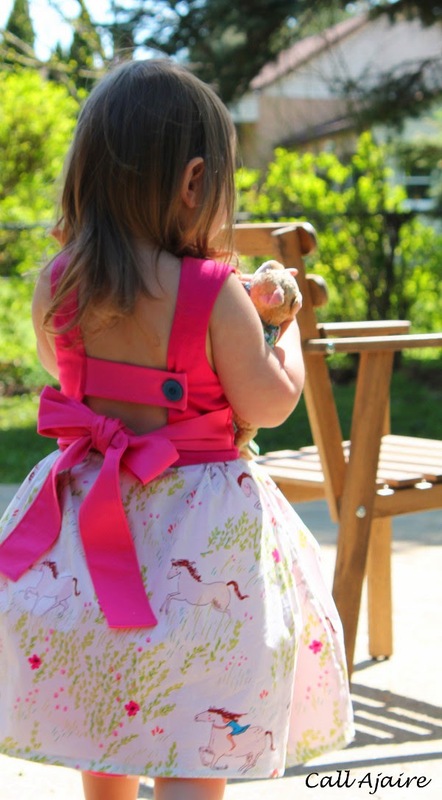 Well, when I found out that the weather was going to be on the chilly side for Easter I made the executive decision (I can do that, cause I’m the mother) to switch the Saffron Twirl dress to Bean’s Birthday Party dress instead. Her birthday is coming up next week so I figured it should be decently warm by then here in Maryland. I posted about a different birthday dress a few weeks ago, and don’t worry, she’ll wear that one that weekend too. We’re fully into the frilly dress phase so no dress will go unworn, hehe. 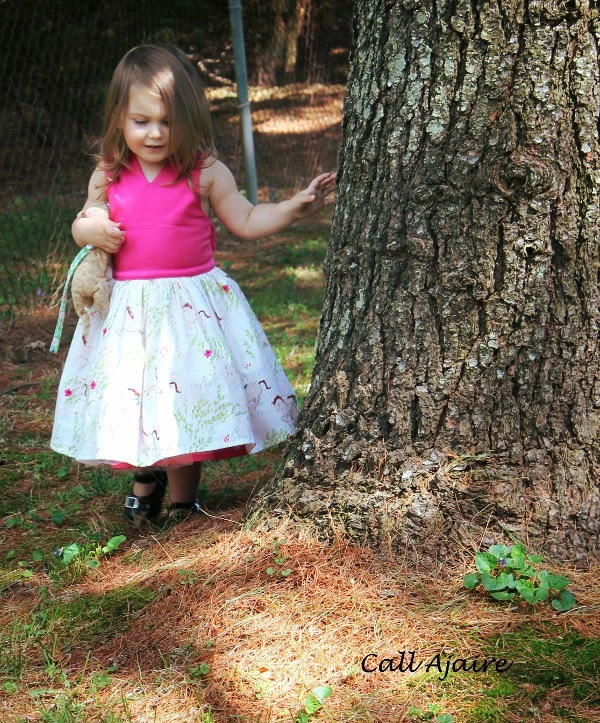 Since it was going to be a birthday party dress I added tulle to make the skirt shape balloon out even more. Tulle is never fun to work with, but I swear this time it was so easy. I should probably buy a lottery ticket cause I’m sure it’ll never go so smoothly again. I know I already said it, but I just adore this dress. The slightly long bodice paired with the extra tulle made the shape even more ballerina-esque and it is so lovely. 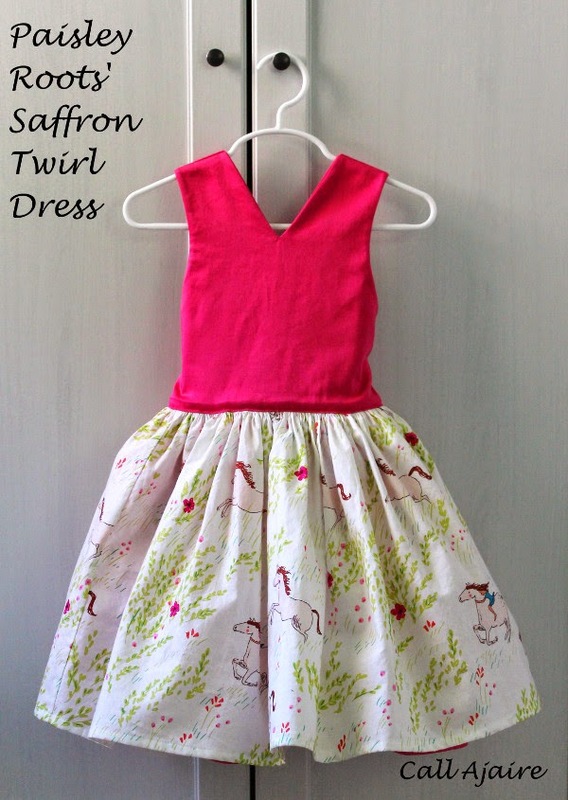 If you would like to purchase the Saffron Twirl dress you can do so here. Or better yet you could purchase the Sew Fab bundle and get a ton of other great patterns as well at a huge discount! This is beautiful! 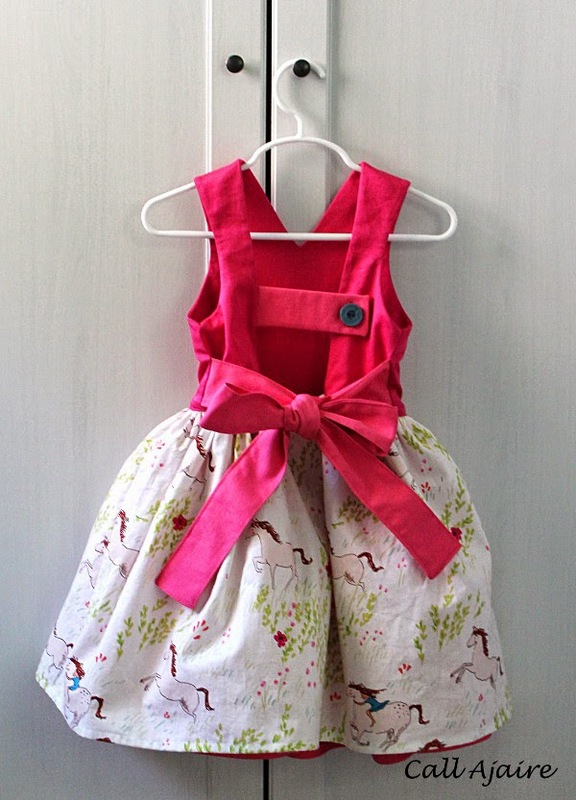 I need that wee wander fabric for my soon to be 3 yr olds birthday who has requested: a horse, a horse cake, a BIG horse toy, horse dress. Yes, a 3 year old who knows what she wants and isn't afraid to ask for it. Lord help me! 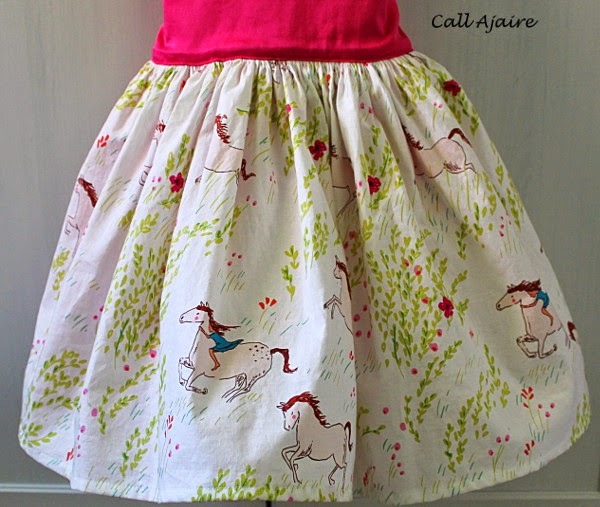 I absolutely love the skirt and not because there are horses on it. I swear I can't look at it without thinking of the picture I have on my blog of me riding like that by accident. The colors in that skirt are so great! LOVE that fabric!!! 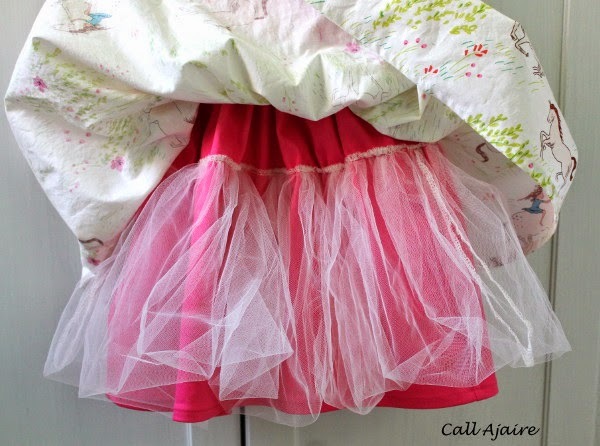 I so need to make one with tulle as well! So pretty! Love the extra skirt and tulle added. Loooove, love, love that skirt. 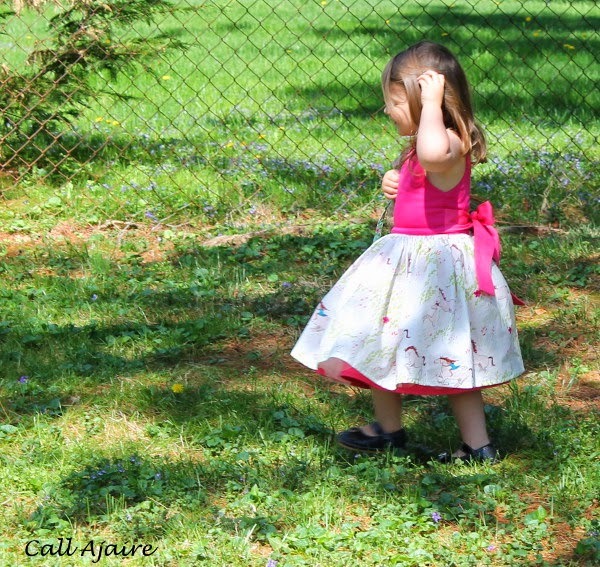 My oldest loves a good twirl skirt. I've never made an underskirt….always so much to learn. That fabric is sweet, too. Love this dress and that fabric is perfect! Monica, underskirts are easy. It's just like using two skirts as one. I like doing an underskirt with tulle so it doesn't scratch the skin AND so there's an easy surface to sew the tulle onto. Otherwise tulle on it's own can be a nightmare. Rachel I couldn't believe that bodice fit so perfectly. When I got it all sewed together I was cursing myself for sewing a 3t without checking the sizing because it looked so big and I was certain it would be hanging off of her. I guess she's bigger than I picture her now 🙂 It fits absolutely perfectly. In other news my girl is huge haha. Melissa, it is so good. I love her designs and this one with the horses is so pretty. For some reason when I click the link I included above the little girl has a coral dress on instead of this blue so if you do purchase and want one or the other it'd be good to double check which one you're buying.